There's been a strong clue for a while regarding Pharah's father in the form of Ana's Uprising event spray, but Overwatch Lead Writer Michael Chu ​just confirmed to Yahoo Sports he's been in the lore before that, too. Pharah's ​Thunderbird and ​Raindancer skins, available since Overwatch was released, have incited speculation that her father might be of Native American descent. The "Newborn" spray seemed to confirm that, as the apparent father of Pharah has some very Native American facial features, an appropriate skin tone, and so on. Fans are right to speculate, as Chu confirmed, “I tend to like hiding some pretty obscure references in the game, and I get equal parts enjoyment when people don’t discover them as when they do," he said. He pulled the wool over all our eyes on this one. 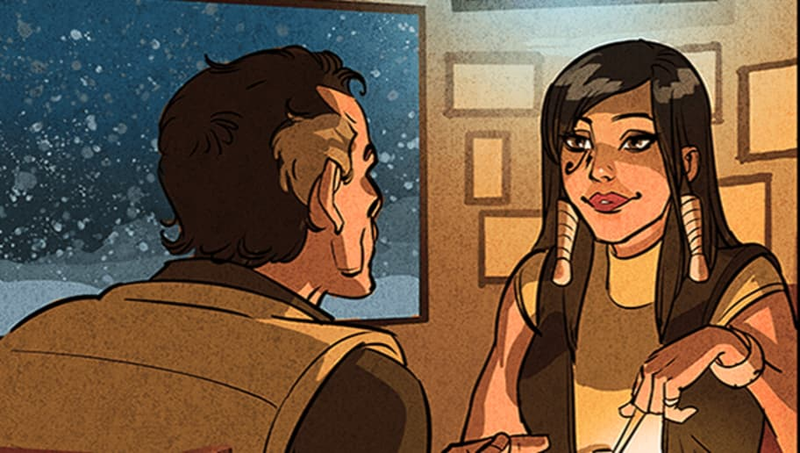 In the ​"Reflections" comic celebrating the release of Winter Wonderland, ​there's a panel where Pharah is dining with a man, apparently in Canada. According to Chu, that's her father at the table. “It featured one panel with Pharah (another of our heroes) and her father having dinner at a restaurant in Canada," he said. That's a pretty serious haircut. This sheds some light on the relationship between Ana and Pharah's father, although not much. "Fareeha Amari" carries her mother's last name, which implies one or two things: Either Ana and Pharah's dad were never married, or he comes from a tribe with matrilineal structures.